In the 1940s and 50s the Communist Party of Great Britain (CP) brought together a remarkably talented generation of historians, including Eric Hobsbawm, John Saville, EP Thompson, Raphael Samuel and Christopher Hill. They transformed the way in which history was written, pioneering the method of history from below, the notion that the past should be studied through the actual lived and creative experiences of real people. Perhaps the most influential member of the group was Dona Torr, but she is today one of the least well known. Her skills were as an editor and translator. Her accomplishments were in creating, encouraging and inspiring a younger generation of historians, and it was the children of her labour who gained the reward. There is little to say about Dona Torr's early life. She was a quiet person, unwilling to draw attention to her work. Unlike several of her contemporaries, Torr did not leave any significant collection of papers or private records, which suggests that she did not think that her own life was in any way remarkable. Torr was born in 1883, the child of privileged parents. Her father was Canon of Chester Cathedral. Completing her studies at University College London, Torr became a writer and journalist. Horrified by the slaughter of 1914-18, she worked for the Labour Party's newspaper, the Daily Herald, which took an anti-war line, and then the Communist Workers' Life. In 1920 she was a founder member of the Communist Party of Great Britain, while later she worked for the publishing company Lawrence and Wishart and married another Communist, Walter Holmes. As a member of the CP, Dona Torr took full part in branch life. Even when she was busy writing, it never occurred to her that she should take time off from her political duties. Fellow Communists remembered her working in her branch, selling the Daily Worker and delivering leaflets from her bicycle during the General Strike of 1926. Some of Dona Torr's most important work was in collecting Marxist classics, she translated and edited Karl Marx and Frederick Engels' Selected Correspondence (1934), wrote supplementary notes for a new edition of Marx's Capital Volume One (1938), and translated Engels' The Origin of the Family, Private Property and the State (1940) and Marx's articles On China (1940). She also edited two volumes of extracts from the Marxist classics, published as Marxism, Nationality and War (1940), as well as translating Dimitroff's Letters from Prison, the story of the Bulgarian Communist arrested and charged by Hitler in 1933 with starting the Reichstag fire. Now that these left wing texts are all readily available, such work may seem trivial or mundane, and it is striking that much of the early work of translation was done by women, from Karl Marx's daughter Eleanor onwards. At the time, however, very few Marxist texts could be found in English. Dona Torr first published a brief biography of Tom Mann in 1936, the introduction promising that 'a full length biography... will be published in the autumn.' It took her 20 years to finish the first volume, and the final book remains incomplete. Unlike some of her contemporaries, Dona Torr never allowed her desire to write to come before her other political responsibilities. In 1946 she received help from Yvonne Kapp, but even with Kapp's prompting, Torr still took full part in political activity, writing as homeless families took over unused properties in 1946 that yet another draft would be delayed, this time 'owing to the squatter excitements'. From 1950 onwards, Torr was increasingly prone to bouts of illness. Despite such setbacks, work continued, and the first volume of Tom Mann and his Times finally appeared in November 1956. Alongside Torr's own material, two of her chapters were finally written up with the help of Christopher Hill and AL Morton. The result was an extraordinary book, not only a biography of Mann, but a history of his times and of the workers' movement in the 500 years beforehand. It was one of the first works of Marxist history written with a living appreciation of the creativity of ordinary people. Torr used no jargon, no condescension, but employed a Marxist technique in which the course of the world was changed from below. The book then returns to the story of Tom Mann. 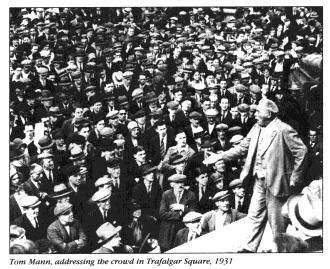 Mann's contribution was as leader of the dock strike, and the book ends on 16 September 1889 with the victory of that campaign. The message of Tom Mann and his Times is that society was transformed by the struggles of workers and the poor. It was one of the first studies written inside the Communist Party to employ the new method of history from below. As such, it also opened up the vision of a new politics, in which society had been changed by ordinary people, and could again be shaped by workers, creating the possibility of a socialism that would come from below. For all her qualities, Dona Torr was unable to escape fully the ideas and influences of her time. Her life was devoted to building the Communist Party, and she could not emancipate herself intellectually from Stalinism. In her work its effects appear only occasionally, but they are there. Always determined to see the world from the perspective of the 'common people', she described her interest as the common English people and, like other Communist Party historians, her work suffers from occasional dark spots of nationalism. Torr stressed the English character of Tom Mann, which was to reduce him, as he was an internationalist who had built socialist parties and trade unions in four continents. She described Marx's Capital as 'a history of England, and much that lay behind its first inspiration came from the first visit of Engels to England in 1842.' Clearly Capital was a history of the development of capitalism which took place in a systematic way first in England, but it was many other things as well. She also wrote that by 1900 the working class had 'made good its claim to be called the people'. In truth, by 1900 the political tradition that cloaked itself in a language of Englishness and the people was actually a tradition of populism and nationalism, with different goals from those of the workers' movement. With the first volume of Tom Mann and his Times complete, but the rest unfinished, Dona Torr died on 8 January 1957. Through her last months the Communist Party was deep in crisis. Following Khruschev's denunciation of the crimes of Stalin and the 1956 Russian invasion of Hungary, 10,000 members left the party. Many party historians resigned from the CP. Indeed the most prominent, notably John Saville and EP Thompson, were at the heart of the 'New Left' that grew up in the 1950s in opposition to the old party. In their Politics, as in their history, they can be seen to have carried on the legacy of Dona Torr's life. Torr herself believed that her greatest contribution had come in the 1920s, when she had been part of a generation that had brought Bolshevism to Britain. She found inspiration from the most varied sources. Her private papers from the mid-1920s include long quotations she had taken from Rosa Luxemburg, Sigmund Freud, Havelock Ellis, William Wordsworth, Joseph Conrad, Aristotle and William Blake. It was certainly not the reading of a pure Stalinist. It may well be that Torr's support is one of the factors which explains the relative independence of the Historians' Group. Indeed, of all the party's scientific, literary and cultural committees, it is the only one whose influence remains to this day. On her death, Dona Torr's library was donated to the headquarters of the Communist Party in King Street. Among the books given was a small pamphlet Leon Trotsky's My Flight From Siberia, which was rarely found among Communists at a time when the party permitted no heretics. Given the creativity, independence and quality of the history she wrote, it is no surprise that she held this book to the end.